Calling all coffee lovers! 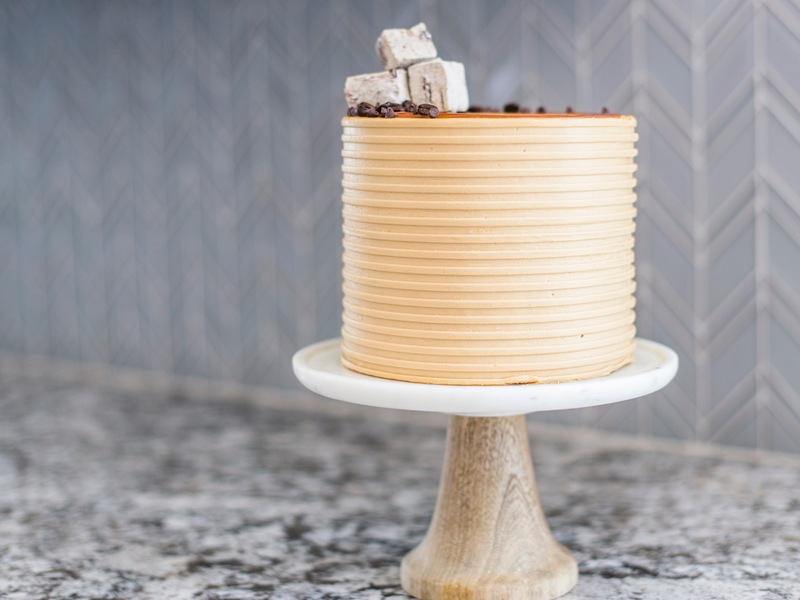 This Mocha Chip Cake is for you! Rich chocolate mocha cake layers with toasted mocha chip marshmallow filling, salted caramel and mocha frosting. As you can probably tell by now, I love creating cakes inspired by other types of treats. My recent Caramel Apple Cake was inspired by the Rocky Mountain Chocolate Factory Apple Pie Caramel Apple. My Tonight Show Cake was inspired by Ben and Jerry’s Tonight Dough Ice Cream. And my Peach Crisp Cake was inspired by the traditional dessert we all grew up on. (The list could go on and on). I love the challenge of trying to put the flavors and textures of other desserts into a cake. I love even more when I’ve succeed and create a delicious and memorable cake! 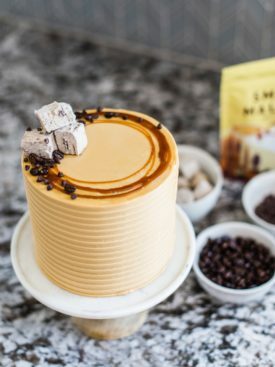 For this Mocha Chip Cake, I used the Mocha Chip SmashMallows as my initial inspiration. I am obsessed with their Cinnamon Churro marshmallow and now use it on top of all my Churro Cakes. And while I don’t drink coffee, I love coffee flavoring in my desserts and have been eager to make another coffee flavored cake since doing my Gingerbread Latte Cake a couple years ago. 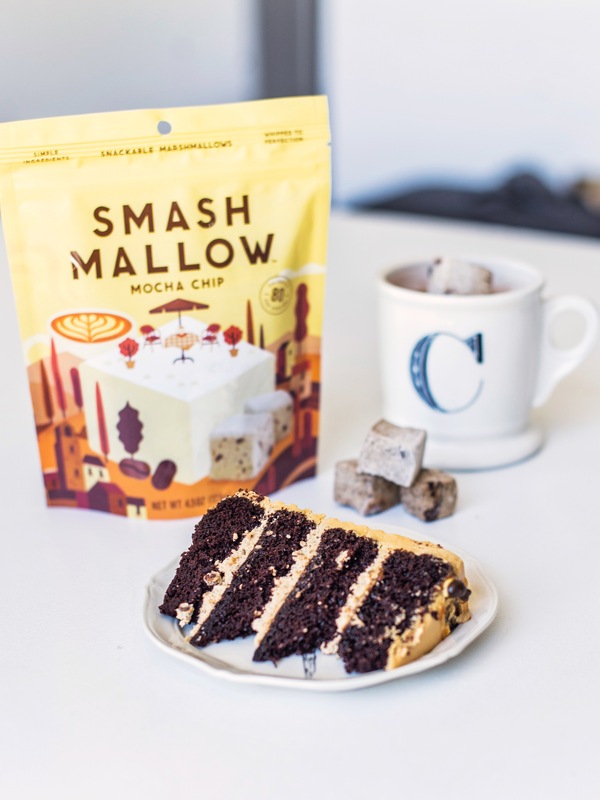 I decided to pair the Mocha Chip SmashMallows with my chocolate cake. Chocolate and coffee are like peanut butter and jelly – they were meant for each other! For the filling, I adapted the toasted marshmallow filling from my Ultimate S’mores Cake and replaced regular marshmallows with the SmashMallows. The one difference to be aware of is that the SmashMallows don’t need as much time in the oven to soften as the typical Kraft marshmallows. Keep your eye on them while they’re browning in the oven. They’ll only need about 30 seconds to cook. I added a little more coffee emulsion to the marshmallow filling to amp up the flavor. I also used a good amount of the emulsion in my frosting too. With all the sweetness in this cake, I felt like it needed a little contrast. The bittersweet chocolate cake helps with that, but I also decided to add salted caramel to the cake. I use it in between each layer and a little on top, but don’t shy away from pouring even more on each slice of cake when you’re serving it. I also threw in a handful of mini chocolate chips in between the layers for a little more texture contrast. If you don’t want to use actual coffee in the cake, just replace it with hot water. You’ll still get great flavoring from the emulsion but you don’t want to lose the liquid. Alright, with all that said, it’s time to get baking! 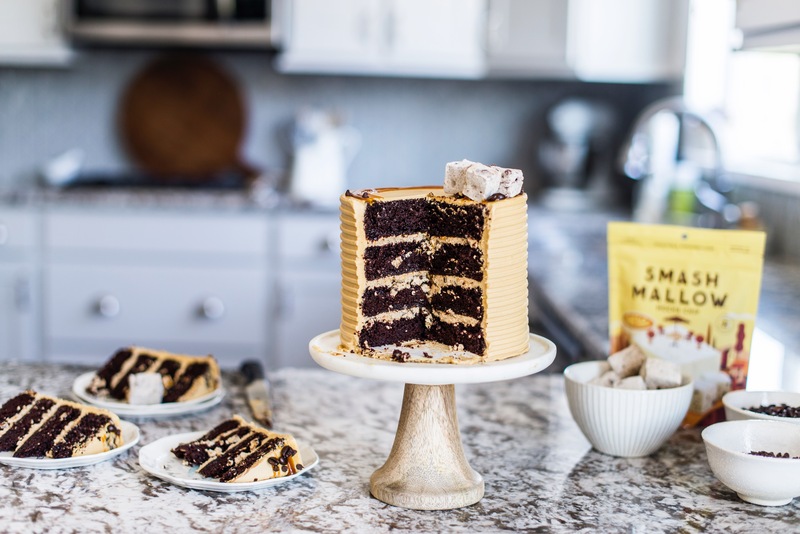 Rich chocolate mocha cake layers filled with toasted mocha chip marshmallow filling, salted caramel and mocha frosting. In another bowl, combine the buttermilk, oil, eggs, hot coffee (or water), vanilla and coffee emulsion. Pour the batter into the prepared pans (about 11 to 12 ounces in each pan), and bake for 16-18 minutes, until a toothpick inserted in the center of the cake comes out almost clean. (A few crumbs on the toothpick is definitely ok!). Level each cake layer with a cake leveler. Use immediately or wrap in plastic wrap twice and freeze for up to a week. If you'd like to freeze the cake layers longer than a week, also wrap each layer with tin foil. Place the marshmallows on a cookie sheet lined with parchment paper and sprayed with nonstick cooking spray. Place on the middle rack of the oven, and broil the marshmallows until golden brown on top, about 30. Keep your eye on them! Can be stored in an airtight container for up to a week in the refrigerator. Bring to room temperature before using on the cake. In the bowl of a stand mixer fitted with the paddle attachment, beat the butter until smooth and light in color, about 2 minutes. With the mixer on low speed, gradually add the powdered sugar, one cup at a time, followed by the salt, vanilla and coffee emulsion. Add the heavy cream and then turn the mixer to medium-high speed and beat for 5 minutes. Frosting can be store in an airtight container in the refrigerator for a week or frozen for up to a month. When you're ready to frost the cake, bring the frosting back to room temperature and mix by hand with a wooden spoon to push out all of the air pockets. Place the first cake layer, top side (crumb side) up on a cake board, set on a turntable. Spread 1/3 of the marshmallow filling on top of the cake layer. Drizzle with salted caramel and sprinkle with mini chocolate chips. Place the next cake layer on top and repeat with filling, caramel and chocolate chips. When you get to the final cake layer, place it top side (crumb side) down. Cover the entire cake with a thin coat of frosting and freeze for 10 minutes. This is called a crumb coat and will lock in the crumbs of the cake so you get a much cleaner looking cake. 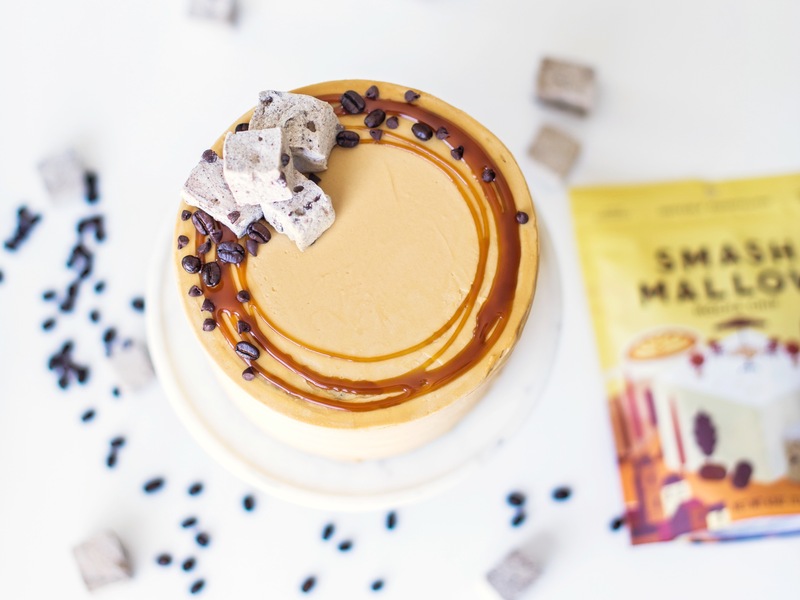 When the crumb coat is set, continue frosting the cake with the remaining frosting and garnish with caramel, chocolate chips, coffee beans and Mocha Chip SmashMallows. I’m assuming this is a sponsored post? I’m wondering why I don’t see a disclosure? It’s actually not sponsored. I didn’t get paid. 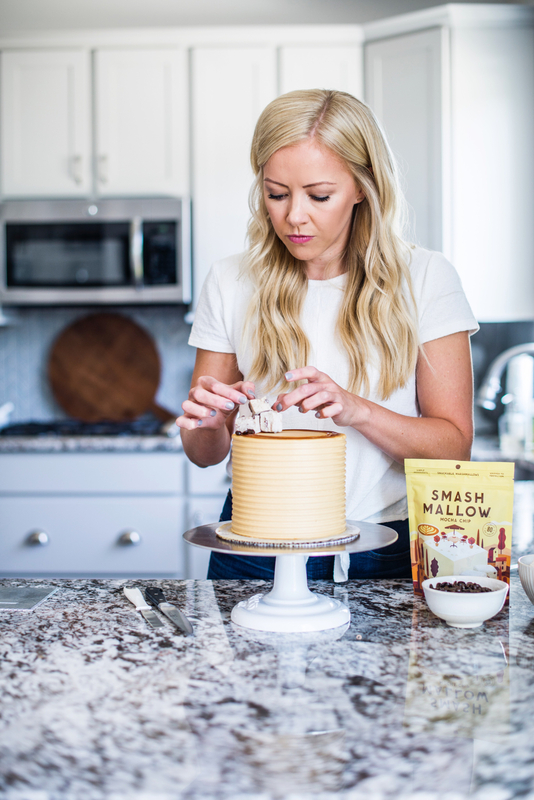 Just love the marshmallows and like to try incorporate different treats, flavors and textures in my cakes. You mention salt in the instructions for the marshmallow filling but not in the ingredient list. I will do a pinch just to be safe, but what is the quantity? Just a pinch is perfect. I’ll fix that. Thank you. His looks lovely! Do you use just any black coffee? I’m not a coffee drinker either so I’m not very familiar with it. Yes, just black coffee (even decaf) works great.